A local action group has asked Ketchum officials to abstain from using pesticides for weed control on public lands—a request it will soon make to other local governments. "The responsibility to control weeds is a very real one," said Kathryn Goldman, campaign director for the fledgling Pesticide Action Network, "but it can be done without chemicals." Goldman told the City Council on Monday that her organization is working to implement a valley-wide pesticide-free weed management plan, starting with Ketchum, and followed by other Wood River cities, county government, Blaine County School District and Blaine County Recreation District in January and early February. The organization is also asking the governments to institute a notification policy requiring anyone who's spraying pesticides on their land to notify their neighbors. "We want people to know where they're used so they can take precautions," she said. Goldman said the main reason for the request is to protect children who are, for several reasons, at greater risk to complications from pesticide exposure. Studies by the U.S. Environmental Protection Agency—available on its website epa.gov/peseticides—suggest that children are more likely to have adverse reactions to pesticides because their internal organs are still developing and pesticides can interfere. "There are 'critical periods' in human development when exposure to a toxin can permanently alter the way an individual's biological system operates," the EPA asserted in a January 2002 report. Plus, children may be exposed to pesticides more than adults because of their behaviors, such as playing on the floor or on the lawn where pesticides are commonly applied, or putting objects in their mouths. The EPA reports the adverse effects of pesticide exposure as ranging from mild symptoms of dizziness and nausea to serious, long-term neurological, developmental and reproductive disorders. The Pesticide Action Network stated that it wants to start by eliminating pesticide use on school lawns, parks and other public places, such as along the paved Wood River Trail bicycle path stretching the length of the Wood River Valley. Jennifer Smith, director of Ketchum's Parks and Recreation Department, said the city "very rarely" uses pesticides, and not in places prone to attracting playing children, such as rights of way along roads. She said Hemingway Elementary School also contracts the department to take care of its lawn, and it uses the same practices there. Smith said the department instead reverts to weed pulling and "soil amendment," meaning keeping the soil healthy to prevent weeds from taking hold. "We're already there," Smith said of PAN's request, adding that when pesticides are used, it's usual a citrus-based natural weed killer. "We get a lot more complaints when people see us spraying than people calling to complain about dandelions." Smith said that's a strong indication of the community's priorities. Goldman said she's asking the city to formally adopt a management plan letting the public know that it's possible to fight weeds without chemicals. "Public agencies can provide an example, can say, 'We think we can do better,'" Goldman said, adding that the city can't prohibit people from using pesticides on their own land, but they would never think to do otherwise unless shown how it's done. "It's a time-consuming education process that can start here." 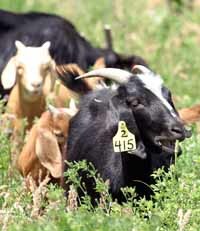 Goldman said one weed-control alternative is to use goats in "target grazing." She said certain bugs get rid of knapweed, and portable steam machines can also be used. "The solution is pretty simple but requires commitment," she said. Goldman said her organization has come to Ketchum first because its members know the city is already proactive on the issue, and would provide an encouraging beginning to their effort. Councilwoman Nina Jonas and Mayor Randy Hall were immediately receptive to adopting a pesticide-free land management plan and a notification process for anyone spraying pesticides in Ketchum. The two city leaders forcefully disputed resident Mickey Garcia, who told them to not immediately jump on board because someone uses "scare tactics" and pleads for them to "protect the children." "Before you let people brainwash you and get scared, take a look at the other side," Garcia said. "Use your heads, look at the data." "Thank you, Mickey," Hall said, snidely adding, "I think." Hall then said he couldn't "disagree more" with Garcia, claiming he doesn't have to be a "brain surgeon" to know chemical pesticides are dangerous. "It's true, it's real," Jonas added. Plus, she said, the city wouldn't be forcing the no-pesticides rule onto residents and businesses. As for making everyone notify their neighbors when spraying pesticides, City Attorney Stephanie Bonney said she needs to look into if that is needed. She said state or federal regulation might already have rules to that effect.